A few days ago I posted a close-up photograph of a newly emerged cicada. Birds prey on cicadas, but they also have another predator to worry about in the insect realm…cicada wasps, or as they are also known, cicada hawks. These scary looking wasps don’t usually sting people, but they are deadly to cicadas. I find their appearance fascinating. …wow. I have FINALLY discovered the answer to a lifelong puzzle. As a child I witnessed a GIANT hornet coming out of a hole in the ground, which was (at the time) seriously terrifying. We had many cicadas in upstate N. Y. in the 50s (according to their cycle, of course). 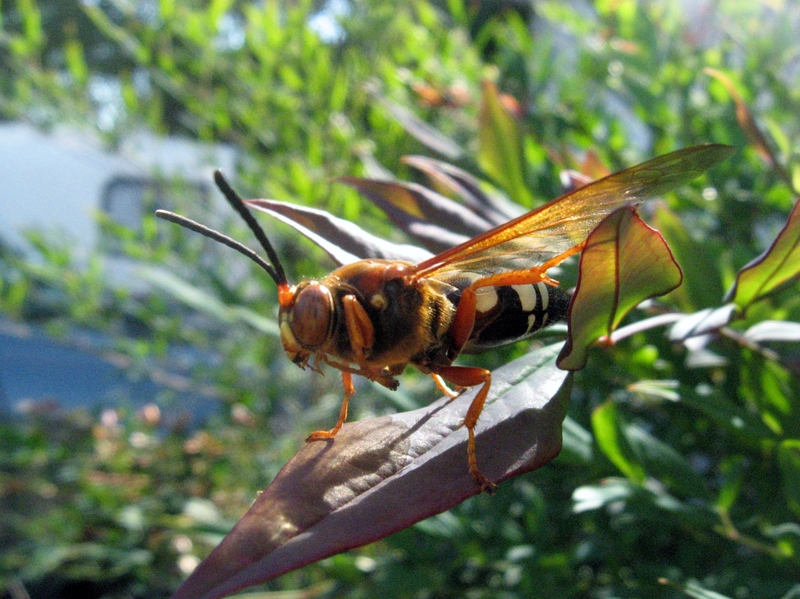 And I recall recounting my citing of this huge wasp to a garden pest expert at an adult meeting, and me being one of very few children, and he chided me in such a patronizing way I have never forgotten it. Nor, though, have I ever forgotten what I indeed saw. And now today, finally, some 60 years later, feel vindicated! Thank you!!! Wonderful! I am glad you found your picture. I, too, would have been scared of this one because of his size. He has to be strong to lug a cicada around! another one of my mysteries solved! They are both amazing bugs, the predator and the prey.